Back in April, Honor announced two budget smartphones to fill out the lower end of its range. The £139.99 (about $185, AU$250) Honor 7A is the cheaper of the two, the other being the £169.99 (about $225, AU$303) Honor 7C. The more expensive phone adds slightly better specs and a dual camera: the 7C has a 5.99-inch HD+ display to the 7A's 5.7-incher, a Snapdragon 450 chipset to the 7A's Snapdragon 430, 3GB of RAM instead of 2GB, double the internal storage at 32GB, and dual 13MP + 2MP rear cameras in place of the 7A's solo 13MP snapper. Both phones have an 8MP front-facing camera and 3,000mAh battery, and run Android 8.0 Oreo with the mothership Huawei's EMUI 8 on top. 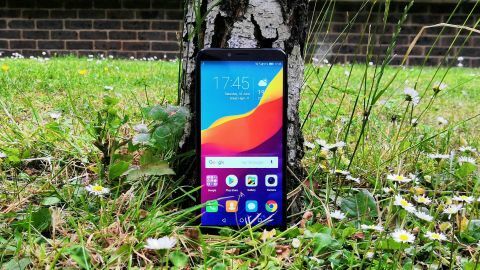 However, it seems Honor is expecting the 7A to have more widespread appeal, given that it's decided to stock the phone at a range of UK retailers including AO.com, Argos, Carphone Warehouse, John Lewis, Three and Very, in addition to the Honor website, while the 7C will only be available at the latter. The Honor 7A is available in the UK now from the Three network, directly from Honor, and from retailers including AO.com and Argos. Currently, we don't have any details of the Honor 7A coming to the US or Australia, but we'll update you if we hear more. Handsets this inexpensive often feel like toys, but that's not the case with the Honor 7A. It's weighty enough to feel solid, and - particularly in the blue colorway of our review unit - actually looks quite smart. The metallic navy blue with silver antenna lines isn't as eye-catching as the laser-like finish of the flagship Honor 10, of course, and unlike that phone it's plastic, but it nonetheless looks plenty good enough to show off without a case. As with many Honor handsets, the fingerprint sensor is circular and found on the back. The camera and flash are enclosed within a slightly-raised horizontal oval up top. There's some subtle blue branding at the bottom, and a more noticeable logo on the lower bezel of the front face, rendered in silver on black. Those bezels are thicker than some will appreciate, but in fairness the tall, sizeable display makes them appear to fade somewhat when the screen is powered on. The rounded edges of the handset have been given a mirror shine, which looks a little cheap to our eyes but will probably please the young market Honor likes to court. The left edge houses the SIM tray, which unusually has space for two SIMs and a microSD card (often the second SIM slot doubles as microSD, so you have to choose). The top left edge contains the 3.5mm headphone jack (annoyingly slightly off-center), and there's the usual volume rocker bar and power key on the right edge. There's no etching on the latter to help you find it by feel, but we didn't have much trouble locating it or mixing it up with the volume keys in day-to-day use. Between the two sets of drilled holes on the bottom end (only one of which is a speaker) is the charging port, which is the old-style micro USB. Yes, this is a cheap handset, but we feel like the time has surely come to switch even the lower-end phones to the superior USB-C standard. Still, it's entirely forgivable, especially when many competing budget phones have the same port. Another area where the price tag shows is the display. Yes, it's a good size at 5.7 inches, and has the currently-favored 18:9 aspect ratio, but it's only 720p - in other words HD, but not full HD. Again, it seems to us that the time for 720p budget phones may be about to pass: even the £95 ($149, AU$199) Alcatel 3V manages 1080p. At 720 x 1440 pixels and 5.7 inches diagonally, the screen comes out at a paltry 282 pixels per inch. That's not great, and a slight softness of text and icons is noticeable, especially up close. There's a good range of brightness levels, though, and both color and touch performance are perfectly good. In fairness, a lot of people won't notice the lower-resolution screen, but it's still disappointing to see 'only' HD when other brands have proven full HD can be workable at this price and even lower. Another big omission is NFC. You won't be able to use Google's contactless payment tech - Android Pay - on this handset as a result. Even at this price, that's pretty disappointing. On the bright side, the 7A is one of the cheapest phones to include Face Unlock, if that's important to you. We tried fooling it with different hairstyles, makeup and glasses and it still worked (albeit slightly slower than other phones), but as ever, it's worth remembering that this type of unlocking is less secure than using your fingerprint, and since it seems to be an afterthought on this phone (it was added using an OTA update), it's probably not the most robust version of this feature. We couldn't fool it with a photo, but we still wouldn't put all our trust in it, especially when there's a fingerprint scanner right there.